A £16 copy of Kate Middleton’s Issa engagement dress sold out in one hour yesterday, as fans clamoured to copy the bride-to-be’s elegant styling. PRINCE WILLIAM & KATE MIDDLETON’S ROYAL WEDDING: EVERYTHING YOU NEED TO KNOW! Having chosen a draping sapphire Issa design for her official royal engagement announcement, Miss Middleton sparked a fashion frenzy, with the designer dress instantly selling out on online store Matches – despite its £349 price tag. With the real deal no longer available, high street stores have been rushing to promote their more affordable lookalike designs – and it seems that fans are just as eager to snap up a copy in order to get their slice of fashion history. When the £16 Florence & Fred replica hit the Tesco website at 1.30 pm yesterday, it instantly started flying off the virtual shelves – and was completely sold out by 2.30pm. 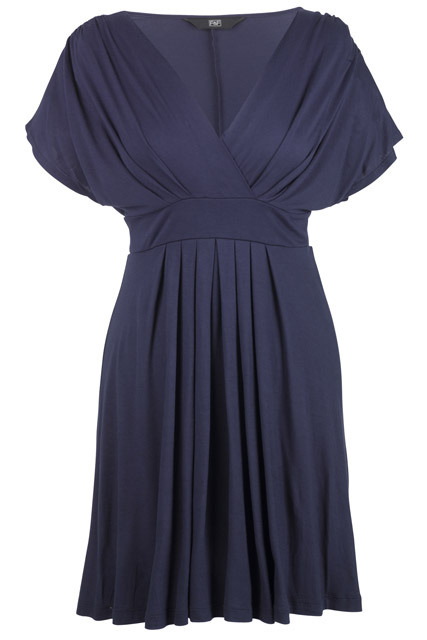 While it might not be a carbon copy of the Issa dress – with a slightly higher hemline and shorter sleeves – it captures that same wrap-front design and distinctive colour – with the overall effect being undeniably similar. But the best part? The utterly affordable price point makes it more than 20 times cheaper than the original. ‘Kate Middleton looked extremely elegant in her choice of outfit and many women wanted to find a high street replica of this now iconic dress,’ says Tesco buying director Jan Marchant. Tesco has confirmed that due to overwhelming demand, the dress will be hitting their online store again within the next few days – so keep your eyes peeled! SEE WILLIAM & KATE’S OFFICIAL ENGAGEMENT PHOTOS HERE!